Fun, family, friends and baseball — what else do you need? How about great MLB baseball gifts that will warm Detroit Tigers fans' hearts and make them purr? We have just that thanks to our Personalized Locker Room Framed Locker Room Art and other stylish sports decor! Easily customizable, this high-quality print allows you to include your loved one's name (or yours!) on the back of one of the four locker room jerseys next to other Cats superstars. 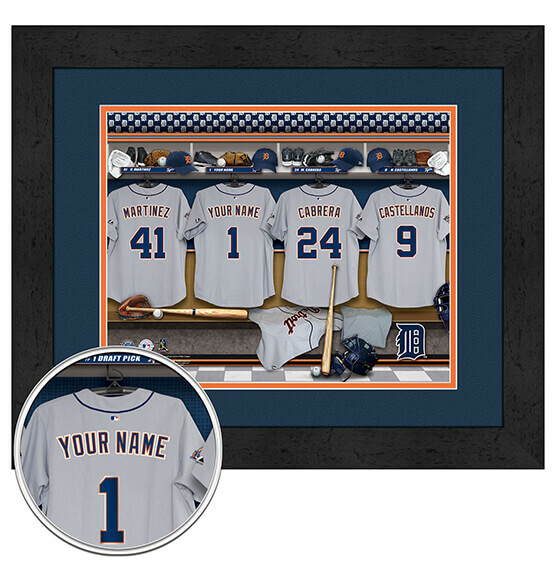 Featuring a digital double mat in striking Tigers' colors as well as a premium, sleek black frame, this great-looking gift is sure to hit a home run with the baseball fan in your life.